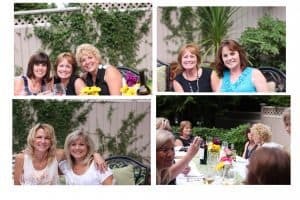 Bunco, a long standing tradition and a great excuse for girls to get together and well, do what girls do! 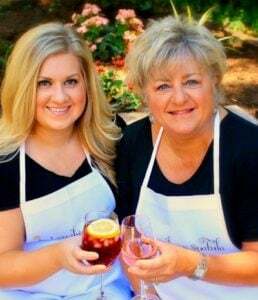 Eat some good food, drink some wine and chat for hours. 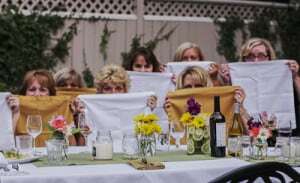 Not once, since I have been part of this group, has anyone busted out a deck of cards! I am so okay with that. Since I hosted this party on a work night..ugh. ( Bunco always takes place on Thursdays.) I had to come up with a menu that could be prepared in advance. 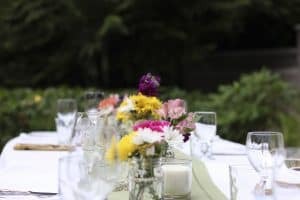 I recently attended a lunch that was hosted by Tom Douglas, the prolific Seattle restaurant owner and chef. He served lunch to 4000 hungry Starbuck workers at our Corporate office. 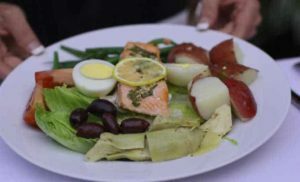 He served Salmon Nicoise Salad and I thought, hey, if Tom can serve 4000, I can certainly bang this meal out for a dozen Bunco gals! I’m not saying it wasn’t a tremendous amount of work, because it was. Anytime you have a group at your home, for a plated up, sit down meal you are going to have to give it all you got. But, this did come together quickly, once all the elements were in place. I served the salad with a Lemon-Dijon Vinaigrette, which I totally made up on the spot and do not have a recipe for. But if Pinterest is your friend, you can find one there. Note to self: Do not try to take pictures and blog a meal when serving…disaster! My photo’s are not my best and I did not get pictures of the cheese platters or the strawberry shortcake ice cream cake…but I got some photo’s of some very, very beautiful ladies who I am lucky enough to call my friends….. Cheese boards with homemade Rosemary Crackers. 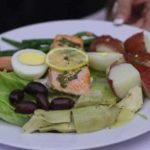 Salmon Nicoise: Garlic Herb Salmon served with marinated artichoke hearts, kalamata olives, chilled crisp beans, boiled and chilled red potatoes and Lemon-Dijon Vinaigrette served over crunchy Romaine lettuce. Strawberry Shortcake Ice Cream Cake – no pictures…too much champagne…ugh! 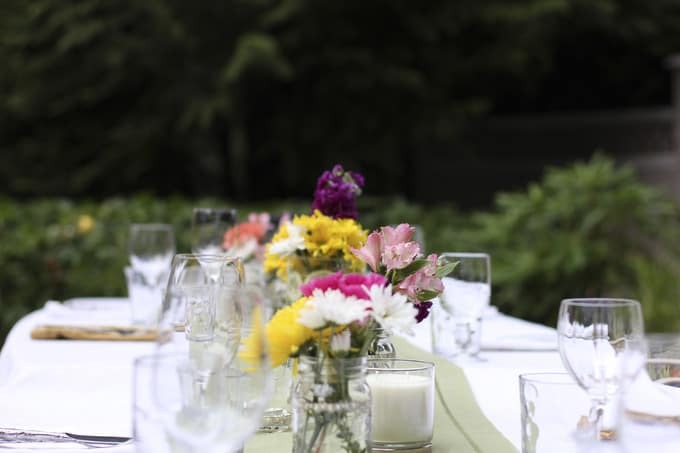 The table is set….the weather is holding…yay! The beautiful guests arrive and enjoy some great conversation, cheese, homemade crackers and wine…(oh, and a few non-wine drinkers who smuggled their beer in their handbags! :). It was a beautiful summer evening. Everyone stayed late and laughed a lot….that is the best thank you a host can get! Cheers girls! This isn't a recipe as much as it is assembling good ingredients. You can serve the salmon warm or chilled. I served mine slightly warm. in Hard boiled eggs - chilled an cut halfs (don't try to quarter they will fall apart). Boil quartered red potatoes for about 10-12 minutes, just until fork tender. Careful not to over cook as they will become mushy. During the last few minutes of the potatoes boiling, throw in your green beans for two minutes. Drain. Chill well. Overnight is best. 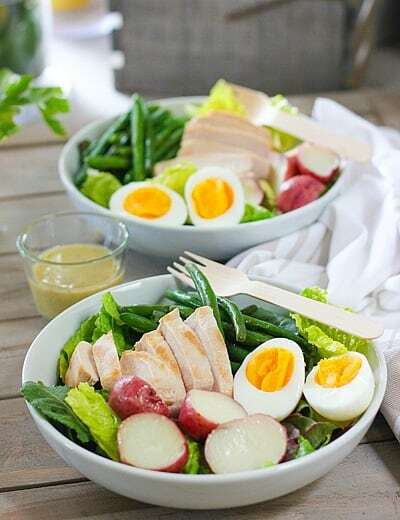 Clean and chop Romaine and plate up!